Posted on December 18, 2018 at 11:52 AM. The i-Weeder hoeing machine hoes exactly where you want it: in all places where no crop grows. High resolution cameras scan the field and the intelligent software can recognize individual plants even at the germination stage. 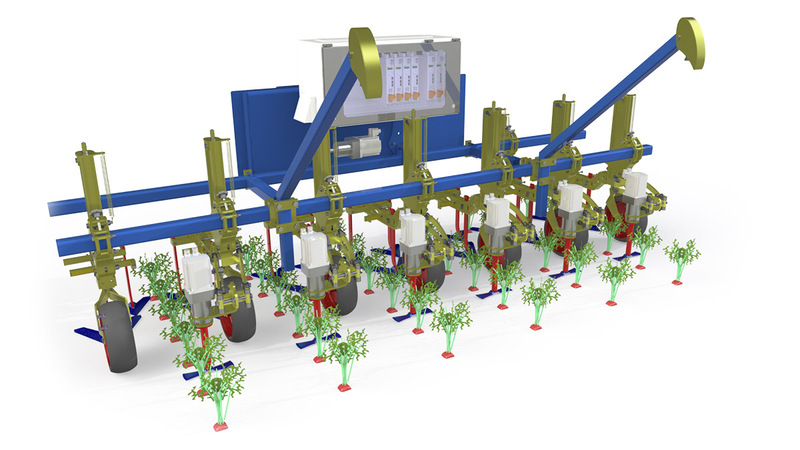 The system works so accurately that the machine can hoe up to the millimeter around seed potatoes and planting material. So not only between the rows, but actually between the plants in the row. The revolving hoes are driven by strong electric motors. The machine is fully electric and is operated with a touchscreen. The movement of the hoe can be adjusted as required: very precise work and hoeing very close to the crop at a low driving speed. But it is also possible to work at a higher speed. The hoe blade then rotates with a continuous movement and then works less close to the crop. The rotary hoe knives are attached to newly developed parallelograms. What is special is that the parallelograms not only work up and down, but they can also move sideways to set the row width. This makes the machine multifunctional. The intelligent i Weeder hoeing machine can be ordered directly at K.A. Havelaar & Zn in Bleiswijk, telephone +31 79 5931307.